Location: Hotel Slavey is situated in the central part of the famous Bulgarian Black sea resort ‘Golden sands’. The hotel is located in a natural park. The surrounding territory of the complex is more than 7000 sq.m. of natural forest. The coolness of century-old trees combines uniquely with the sea breeze and the caressing sun rays, thus turning the hotel complex in one of the few left green oases along the Black sea coast line. The distance to the sandy beach is about 250 m. Only 200 m. is the distance from the hotel to the center of the resort with its various possibilities for entertainment, sport and active night life. Accommodation: Modern hotel architecture and design, uniquely added to the surrounding nature, will make your holiday a memorable event. The hotel disposes of 156 double rooms, 65 double large rooms, 5 studios and 7 junior apartments with individual air-conditioning. The public areas, restaurants and bars are also air-conditioned. Wine & dine: Buffet restaurant: The main buffet restaurant seats 200 people indoor and 100 people on the open restaurant terrace. The variety of culinary specialties from Bulgarian and European cuisines will satisfy the most refined taste. Abundance of fresh fruits and vegetables is offered to the lovers of healthy food. ‘Show cooking’ is also available at lunch and dinner times. A-La-Carte restaurant: The guests of hotel Slavey can enjoy one dinner per stay in the exquisite atmosphere of the A-La-Carte restaurant. Reservations for the A-La-Carte restaurant are made at reception by 11 o’clock of the preceding day. Lobby bar - Open 24 hours. The lobby bar offers variety of local alcoholic and non-alcoholic drinks. One drink at the sunny terrace of the lobby bar, facing the sea will fill you up with positive emotions for a long time. Snack bar: The snack bar offers breakfast to the late-get-up lovers. For those who like to take a snack around the swimming pool there is pizza, sandwiches, French fries, pastry and ice-cream. - Aerobics, table tennis, darts, football on the beach, volleyball on the beach. Services subject to additional payment: Safe; Internet; Lobby bar; Billiard; Towels (deposit), Laundry. 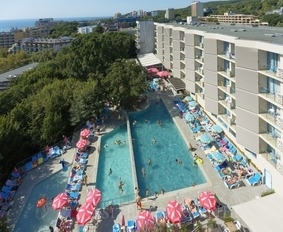 Sports and recreation: For the complete relax and entertainment of its guests the hotel has three outdoor swimming pools with a sunny terrace, a spacious indoor swimming pool with heating for colder days, Jacuzzi, sauna, fitness room, massage, volleyball and mini-football playground, table tennis, billiards, amphitheatre for evening animation. Childcare: For the little guests there is a children’s playground in the garden, a separate outdoor swimming pool with water slide and a Mini Club at reception. A team of experienced animators takes care for the good mood. There are special everyday programs for sports and entertainment. The abundance of culinary temptations and drinks of the ‘All Inclusive’ system will make your vacation unforgettable.